Compared to previous years, 2014 saw a somewhat lower number of volunteers joining us in Zambia. This put the spotlight even more on the extraordinary contribution that both of them made to our projects. During spring of 2014, Elisa, a professional teacher by trade, supported the Mackenzie Community School in a very constructive and comprehensive way. The local teachers really appreciated her unwavering and loving engagement as well as her constructive feedback. Later on in the year, Viktoriya tirelessly supported the St. Anthony Children's village for a period of two months and put all of herself in serving the children there. Her patient and caring approach to each and every child did not go unnoticed with the local staff and was greatly appreciated. Both of our volunteers thus were able to leave deeply positive impressions with the local population. In addition, three iChange management team members visited Zambia over the course of 2014 in order to look after our ongoing projects, meet with and support our local partners, as well as establish new relationships. Altogether, the team spent more than three months on location in Zambia. 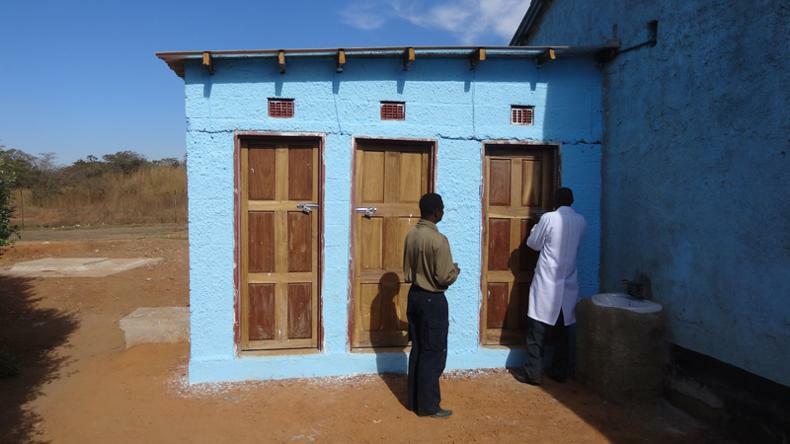 With the successful construction of the new toilets at Mackenzie Community School a major project was accomplished within a short period of time. Since summer 2014, and for the first time in the school's almost decade-long existence, there now are sanitary, flushed toilets available. The improved hygienic conditions not only are welcome by teachers and students alike, also parents and the Mackenzie Community at-large are excited about the visible upgrade of 'their' local school. Particular praise in this context must be given to the very positive and efficient cooperation with the local city government, which greatly facilitated the speedy and successful completion of this major project. Already in our previous Outlook for 2014 we informed our sponsors and readers that the Scholarship Program and the Mackenzie Community School, after encountering some structural challenges in 2013, would be a focus area for this year. For the Scholarship Program we made arrangements to have a tutor support our participants directly; this was in response to the rapidly decreasing quality of education at public schools in Ndola, which threatened the successful completion of our participants' coursework. Already after only a few months we were able to see noticeable changes and the first test results of our participants confirm this impression. We are planning to put further measures in place during 2015 to strengthen and improve the Scholarship Program before accepting a new round of participants. At Mackenzie Community School, various steps were first discussed and then implemented together with the teaching staff in order to improve quality of education across all grades. We are very excited that the latest annual government assessment for community schools in Ndola, which was conducted at the end of 2014, already showed the first improvements. We plan to do everything necessary to continue this trend in 2015. This includes adding one more teacher to the teaching staff at Mackenzie Community School in order to provide a better workload distribution among all teachers and thus allow for increased one-on-one teaching situations with the students. In the context of our Microfinance Program, we were able to gain one of our most successful participants of the past years, Carol, as an assistant. She will support Charles, who in the past had to handle all the various aspects of this program on his own. Based on her own experiences, Carol will focus on preparing and coaching participants in our Microfinance Program in order to improve the overall success of their business ventures. Charles will continue to manage all administrative matters. For the first round of new participants this coaching function already proved extremely helpful and a more reliable repayment history has been observed. Another milestone in 2014 was the beginning of a new strategic partnership between the 'Madalitso Wits Sports Academy', the 'Eagles Wings Community School' and iChange. Both of these new partners are led and managed by a local team and have successful projects with further potential in the Twapia Community, in the northern part of Ndola. During a one-year test project, iChange will support six students of the sports academy in order to enable them to attend community school. If this proves to be a successful cooperation, we are hopeful to expand our support and partnership to serve a larger group of children. For 2015 already two visits by iChange team members are planned, including possible support by volunteers. We are humbled and thankful for the positive developments that took place in 2014 and will give our best to carry this momentum into 2015. Our heartfelt and sincere thanks goes especially to all our supporters, donors and volunteers, who again partnered with us during the past year and thus made it possible for iChange to successfully continue our projects.